Hey guys, its time for something new today. Forget about all the deck , strategies and card spotlights. Today, we’re gonna look at some fun facts about Clash Royale will surely amaze you. The 100th card will be released on 20th April 2018. The 1000th card will be released on 18th October 2052. The 10000th card will be released on 10th October 2397. 2) Few cards had their Elixir cost changed that is not mentioned in any notes to this date. Inferno Tower, which was seen to cost 6 Elixir and costs 5 today. 3) Zap initially didn’t stun until 29/2. However, it could one-shot Minions one level lower. Also, Zap’s stun duration was 1 second which was changed to 0.5seconds due to it being overpowered, and scarcely available. 4)Assuming you have a 50% win rate, there is a 0.647% chance of you getting 12 wins in a challenge. Increase that win rate to 80% and that chance rises to about 44.8%. Further increase the win rate to 90% and you have a 84.2% chance of getting 12 wins. 5)Princess’ Splash Radius was once comparable to Zap. Now, it’s just comparable to Rocket. Same thing with Ice Golem’s explosion radius being comparable to Freeze before nerf. Now, it’s explosion has same radius as Rocket. 6)Fun Fact : The Wizard once had the same hit speed as Electro Wizard. 7)Silver Chest has a lower chance of containing a Rare or Epic card than a Free Chest does. For Rares, it’s 1 in 12 and for Epics, it’s 1 in 500. On the other hand, a Free Chest has 1 in 10 cards contain Rare and 1 in 200 cards contain an Epic. 8)Goblins, Spear Goblins, and Sparky have never had their stats touched by any balance update. 5 – When Clash Royala just got Released, Legendary Cards did not exist. 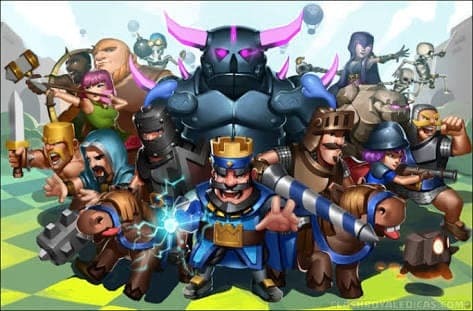 10)Clash Royale first softlaunched on iOS on January 4, 2016, exclusively to eight select countries: Canada, Hong Kong, Australia, Sweden, Norway, Denmark, Iceland, Finland, and New Zealand. Unfortunately, Many did not live in these countries, but were still able to download Clash Royale from the Canadian app store by changing their location. 11)You had to pay Gold to battle multiplayer or friendly battles. This severely limited playing as it meant that you would have to spend your Gold on battles, rather than saving them for upgrades. 12) The Freeze Spell was the best card in the game by far due to its 4 tile radius and long duration. So it received a much needed nerf, decreasing its radius to 3 tiles. Funny thing is, even after this big nerf, the Freeze Spell was still the best card in the game for months. 13) The X-Bow was the most hated card in the game. It was a nightmare for new players to deal with as it was a highly reactive card. It was a super strong card as it only took 3 seconds to deploy and target and had lots of Hit Points and also had an insane 13 tile range. So this card received a 15% HP decrease and was limited to only targeting ground units. Yes, the X-Bow used to also target air units. 14) Almost all defensive buildings had their lifetimes significantly decreased as these buildings made defending too easy, to the point where gameplay was severely slowed down, leading to lots of draws. 15)The Cannon and Mortar both used to cost 6 Elixir. Because of their high cost and inability to target air units like the Inferno Tower, they were rarely used, so their Elixir costs were significantly reduced. Cannon became 3 Elixir and Mortar became 4 Elixir. The Royal Giant was given a 1 tile range increase seeing how weak it was, which allowed it to outrange most defensive buildings, most notably the Inferno Tower. This was another big buff to the Royal Giant, and his usage started to rise and rise. May , 2016 – At this time, the Royal Giant was everywhere. It didn’t take long for him take over the meta because he’s a Common card, making it easy to level him up quickly. The Royal Giant quickly went from being one of the worst cards in the game, to the most hated card to battle against in the game. The X-Bow was the most hated card for about four months, but to this day, the Royal Giant is still the most hated card. It’s been 1 year , and so many people still look down upon the Royal Giant. 17)Surprisingly, even after the Cannon got nerfed a crazy amount of times, it was still one of the most used defenses in the game because the Hog Rider was everywhere and the Cannon was the cheapest answer. 18)A new Tournaments game mode was introduced, which is currently known as Custom Tournament. At this time players were able to create a tournament with an insane 200,000 gems, where the top player can win 15,000 cards. 19)Spell cards such as the Rocket and Fireball used to do so much damage to Crown Towers, to the point where players would just use a bunch of buildings in their deck with little to no offense and just keep Rocketing your tower to win the game. This was actually a powerful strategy and quickly became super annoying. So damage to Crown Towers by Spells were reduced by 20%. 20)The Musketeer used to cost 5 Elixir, but the Wizard overshadowed her as he was much better because he was able to do splash damage, damaging multiple units within his vicinity unlike the Musketeer, who was only a single target attacker. So the Musketeer’s cost was reduced to 4 Elixir. That’s it for this article guys. I hope you enjoyed these fun facts. Cheers.